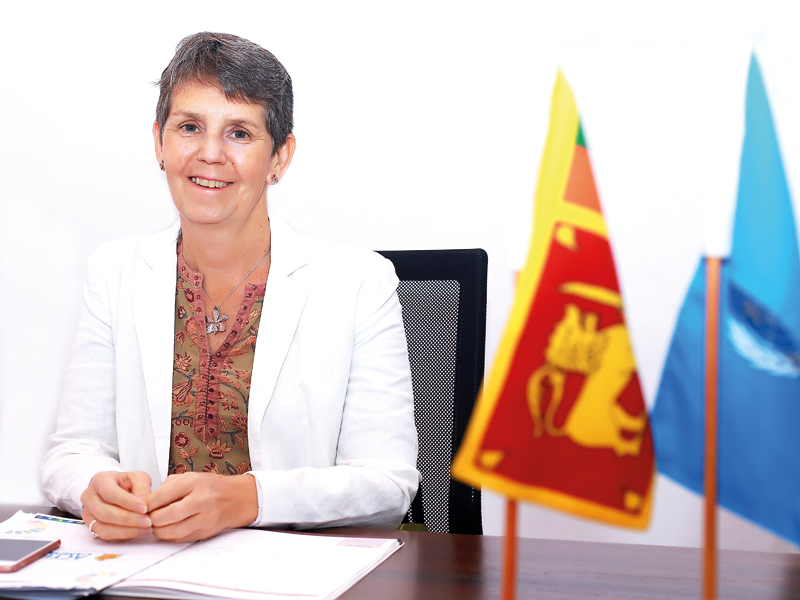 Lanka Woman met Una McCauley, Resident Coordinator United Nations Sri Lanka and Resident Representative UNDP, Sri Lanka, in her office at the UN Headquarters at Bauddhaloka Mawatha, Colombo 7, to find out her role as the new UN and UNDP Coordinator and what agendas the UN has for the uplifting and empowering of women in Sri Lanka in all sectors. QMs. McCauley, please tell us about yourself, your family, your education, and upbring-ing. I grew up between England and Ireland, and so I would always consider myself probably London-Irish., I come from a line of women who fought for education and the rights for education, for all of my generation of cousins, I think it was for the rights of girls who moved from poverty, one or two generations ago, into what we would call the middle classes now, through education, at a time when education in England and Ireland was the main means of social mobility. So I come from a line of women who always felt empowerment in education. I’m now the only child of my mother, who was just eighty last week, and I have two boys, one of them is at university and one is working. So I’m finally alone again as my youngest just left and went to university in September. And I guess what’s interesting about our relationship is that, I adopted them from Liberia during the armed conflict then. And through that adoption, by proxy, I have a large extended family also in Liberia because their father is alive, and he wasn’t able to look after them. So I have a large Irish family and a large Liberian family spread across the world. QTell us about your career, what led you to this position you hold today? My initial interest was in social work, and doing social work in Europe. But I think i’m probably one of the luckiest people I know, I was travelling in Central America before ending university and before starting a real job search and I somehow fell into a job working with former street children in Mexico, and from there I got experience of children who’d lost their families or loved ones, who had lost contact with their families, to reunite with their families., and this was the same time as the Rwandan genocide and the armed conflict in Liberia, and a number of NGOs were looking for people who had family tracing experience and I applied for jobs, doing that really on the off chance, because it wasn’t a planned career path, and ended up working in children’s policy work in Africa. So, from London to Mexico to West Africa, where I became really passionate about social protection policy, social welfare policies for children and also for protecting children who had either been affected by armed conflict or who have participated in armed conflict. And then again luck had it that one of my managers, my country director of UNICEF at the time said to me, “You really ought to be a country representative for UNICEF because you have a lot of interests, you are a fairly good manager, and you have a good understanding of the big picture. So I applied for a country representative post and ended up working as a country representative for UNICEF and that brought me to Sri Lanka.